Are you having a last minute holiday panic attack? You have the turkey brined, the potatoes smashed, the cranberries sauced, and 4 sorts of vegetables cleaned. But…what if you don’t have enough? (Of course you do). If you are like me, the last hours of party prep often include last minute additions to the menu – just in case someone, heaven forbid, should waddle, I mean walk, away from the table still hungry. Such was the inspiration for these stuffed dates. I added them to my holiday menu in a sudden moment of panic (maybe 3 appetizers were not enough!) I had all the ingredients on hand: goat cheese for the cheeseboard, dates to accompany the cheese, rosemary in the garden, and Proscitto, a permanent staple in my refrigerator. Prosciutto is easy to store and ready to pull out for charcuterie boards, draping over pizza, and layering into salads. I love it as is or baked in the oven where it crisps, waiting to be snapped into shards and sprinkled over pasta, soups and salads. 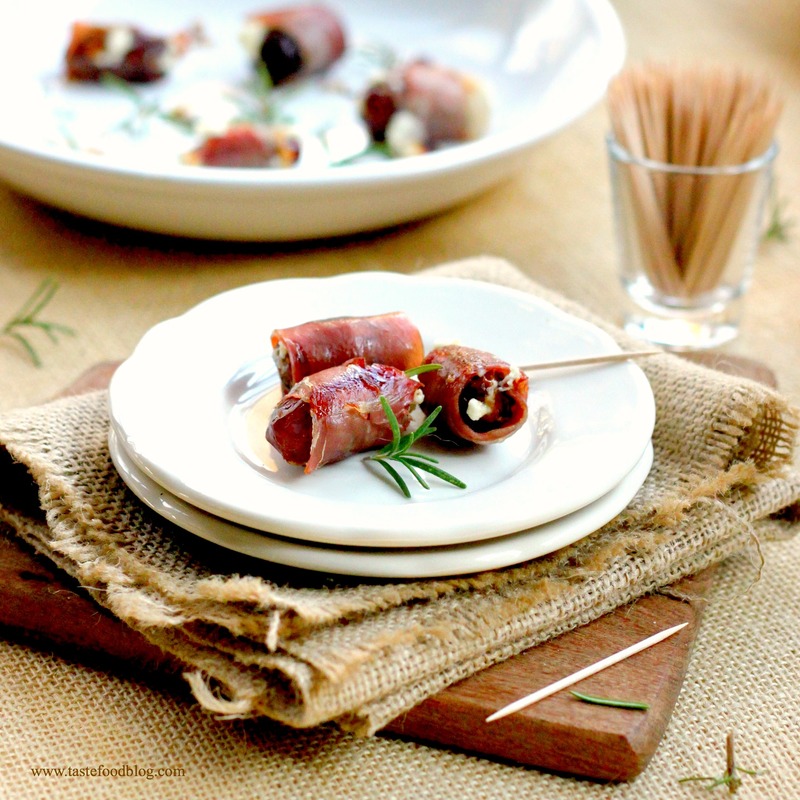 For these appetizers, the prosciutto wrapped up the dates, sealing in the filling and creating tidy flavor-packed nuggets – sweet, salty and creamy at once. They were easily assembled one day in advance, simply needing a quick bake to crisp the ham and amplify its saltiness, providing a perfect foil to the sugary dates and mild goat cheese. Preheat oven to 375°F (190C). Combine the goat cheese, rosemary, orange zest, salt and pepper in a small bowl. Mix with a fork to soften and combine. Make a small incision in the dates lengthwise and remove the pits. Using a teaspoon or your fingers, fill the cavities of the dates with the goat cheese. Wrap each date with a strip of Parma ham. Place seam-side down on a baking sheet. Bake until the ham is slightly golden, about 15 minutes, turning once. Transfer to a serving plate and cool slightly. Garnish with rosemary sprigs. Serve warm. Delicious bites! A tasty combination and wonderful idea. YES. Such an interesting combination, but they taste SO DARN GOOD together!! I was shocked the first time I tried something similar to this, but it was delicious! These will be part of my holiday party spread this year for sure! What an amazing blog and stunning photography!! Love this recipe, so easy, yet delicious and very interesting!